A practical, how-to guide regarding legal issues and business benefits of ownership incentive plans, especially ESOPs. Describes how they can be used to expand or sell a company, increase productivity, takeover a firm, defend against a takeover and restructure employee benefits. Experts in a variety of fields contribute short summaries which deal with particular questions of interest. 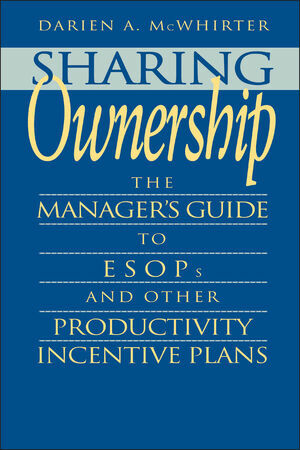 Darien A. McWhirter is the author of Sharing Ownership: The Manager's Guide to ESOPs and Other Productivity Incentive Plans, published by Wiley. Pensions and Employee Benefit Plans. Using an ESOP to Grow a Company. The Future of Ownership Sharing.